The Pearl of Naithon has Sea Facing Luxury Apartments and Duplex Penthouses for sale next to Naithon Beach and has been designed to offer clients a unique opportunity to own or rent a luxury apartment or duplex penthouse in one of the world's most stunning locations. The beach is just 50 metres away. 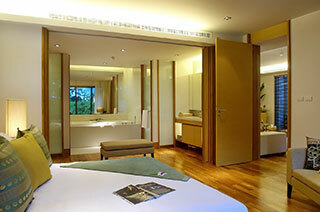 Naithon boasts to having one of the very best beaches on the sought after West Coast of Phuket. It is an idyllic location surrounded on all sides by tropical landscaped hills which form part of the Sirinath National Park. It is perfectly situated for golf with four world class golf clubs within 15 minutes drive. Blue Canyon (two courses), Laguna's Banyan Tree, Phuket Country Club and the new Jack Nicklaus - designed Mission Hills (two courses). 77 Luxury Naithon Apartments for Sale including Penthouses over six 3-storey buildings surrounding the communal lagoon-style swimming pool. Please email us for details at sales@pearlofnaithon.com. 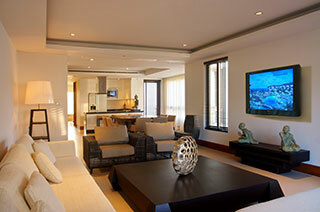 Our four bedroom Super Duplex Penthouse offers 332 square metres of luxury living space across two levels. Master bedroom with direct access to your private terrace. Three guest bedrooms. Entrance to the penthouse is via your own private terrace garden. 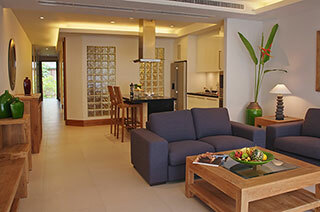 Our four bedroom Duplex Penthouse offers 248 square metres of luxury living space across two levels. Master bedroom with fitted wardrobes and dressing area, open en-suite with closing privacy doors over double bath, double basins, mirrored storage, shower. From the bedroom glass sliding doors lead to terrace with glass balcony. Extremely well appointed and luxuriously furnished, our three bedroom ground floor apartments cover a total of 238 square metres. These Luxury Apartments feature a large secluded garden terrace, en-suite bathrooms and are fully furnished to the highest quality. Extremely well appointed, our one and two bedroom apartments cover a total of 117 square metres and feature a 5.5 square metre balcony overlooking our tropical gardens and lagoon swimming pool. The open plan kitchen features a granite-topped island with ceramic hob and a 4 seat breakfast bar. A large American fridge/freezer, built-in oven, built-in microwave and ample storage are all included. 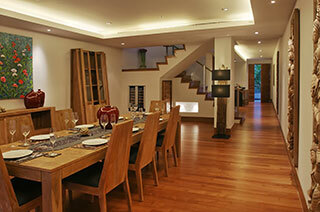 There is space opposite the breakfast bar for a good sized dining table which leads into the main living area.